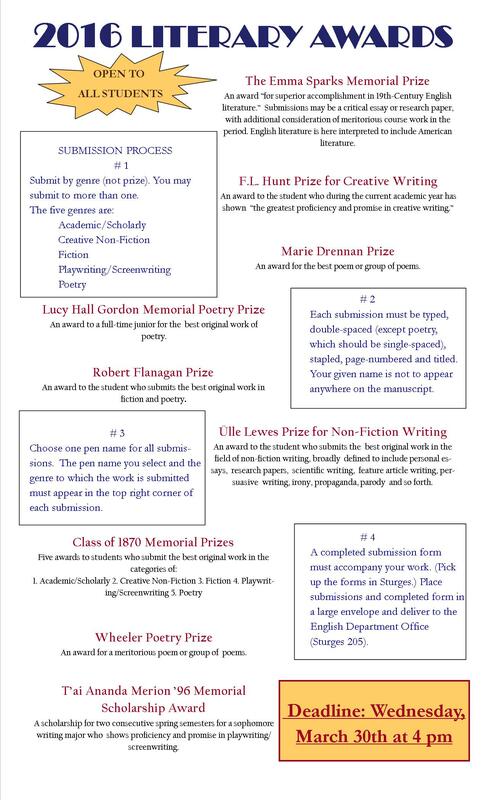 Open to all students, the departmental literary awards seek to honor the best undergraduate writing in fiction, poetry, creative nonfiction/essay, playwriting/screenwriting, and academic and scholarly work. All entries must include a submission form and be submitted no later than March 30th at 4pm. More information can be found here. Founded at Dakota Wesleyan in 1924, Sigma Tau Delta has an outstanding national reputation. Ohio Wesleyan University established the Eta Sigma Chapter here several years ago in order to recognize outstanding achievement in the English Department. Students must meet the requirements for inclusion in the English Honorary. Each student must be a registered major or minor, have a 3.5 GPA or greater in English, be in the top 35 percent of their class, and have completed at least 3 English courses above the freshman writing course. For more information, please visit the official Web site of Sigma Tau Delta, the International English Honor Society. The Student Board is an elected group of upperclassmen who act as liaisons between students and faculty, assist in interviewing candidates for new faculty openings, evaluate the English department faculty, choose the Laureate Awards for freshman writing, and plan English Department special events. The 2015-2016 student board members are Julia Stone, Chair; Miranda Dean; Abby Hanson; Vanessa Van Besien; Timothy Yang. The English Department's student-run literary journal, The OWL, publishes the best in undergraduate creative writing, including fiction, poetry, essays, academic writing, plays for both stage and screen, and fine art. The online version, The Night Owl, features original work, criticism, and scholarly book reviews by both alumni and current students. The Writing Resource Center, located in the R.W. Corns Building as part of the Sagan Academic Resource Center, operates to provide professional tutorial instruction, writing practice, and evaluation/criticism for students needing to improve their writing skills to remove an unsatisfactory notation (“U”) from their academic records, or for their own satisfaction. The Writing Resource Center is available without charge through referral by an instructor or through self-referral. Writing Resource Center instructors work with the problems of unity, organization, and development of short expository papers and with mechanical, syntactical, and stylistic problems at the sentence level. Furthermore, professors frequently remand students to the Writing Center for instruction on correct documentation and blending of sources. In addition, learning-disabled students and international students are assisted in achieving writing competency. All students are tutored in the Center at times adjusted to their schedules, usually for one hour per week for as long as the students’ individual needs dictate. Students receiving a “U” grade in any course are required to report to the Writing Resource Center immediately at the beginning of the next semester, and must complete the program to remove the “U” by the end of the semester. Failure to complete the tutoring program for clearing “U” notations may result in academic dismissal.